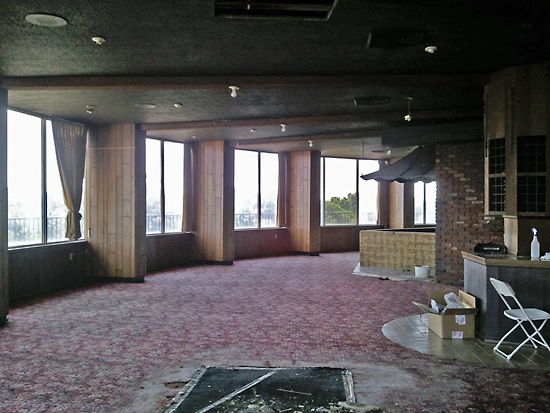 This post about Top of the Tower Restaurant from October 2007 is by far the most-commented entry I’ve ever done. Within the comments, we hear from the granddaughter of Tower’s developer Bud Dallavis, as well as several people who worked there over the years. We learn that it did NOT spin (people confuse it with the former Stouffer’s restaurant in Downtown St. Louis), and a few people share the recipe for Rizzo’s famous Spinning Salad. A post comment from the end of July 2011 set off alarm bells: Michael Collins went on an adventure inside the Top of the Tower building, and made it all the way to the top and inside the long-vacant Rizzo’s Top of the Tower. He even took pictures! I pounced on him like a puppy to a chew toy, and he gladly consented to share his photos on Facebook so they could be shared on B.E.L.T. All of the photos you will see here were taken by Michael with his cell phone. 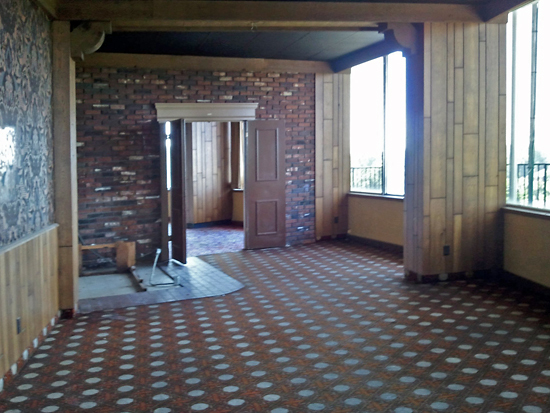 The elevator in the Tower lobby no longer goes up to the top floor, but the stairs do. When Michael got to the top, the door to the restaurant was wide open, “and there were no signs stating no trespassing, although I’m sure they don’t really want anyone up there. I don’t really recommend going up there for your own safety.” He told of some strange encounters with questionable people (and dogs) during his time in the building, so I’m heeding his advice, and very grateful that he chanced it, took these photos and shares them to add to the history of a beloved North County restaurant that continues to be held warmly in the hearts of all who went there. After the adrenalin high of sifting through his photos, I was feeling like Peggy Lee asking “Is that all there is?” This is what the mythical place actually looked like? Really. My overall impression of Rizzo’s interior is what I call Spanish Bachelor. It’s a term I use to describe a late 60s/early 70s design plague in swingin’ suburbia. It was a hearty embrace of EZ Brick, Chianti bottles with candles stuck in ’em, blackened wrought iron (real or fake), dark distressed wood, masculine-colored velvets, corduroy pillows and macrame plant holders. It was a look favored by heterosexual single men, and we’d have to ask one of the survivors of this faux-rustic 16th Century Spanish matador design decision what it was meant to convey. 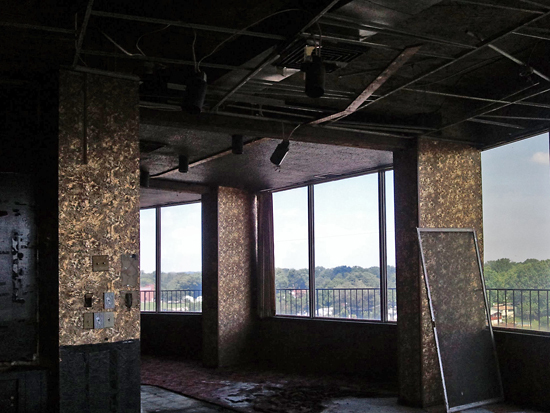 I never imagined that the penthouse showcase of the magnificent mid-century modern tower – all pink metal tubular sleekness – would look like this. In the photo above, the wood paneling on the window columns feels right for a place that opened in 1964. I’m assuming the ceiling was originally white so that the coffers radiating out from circle center met up with the paneled columns to create a starburst effect. But the rest of this….? 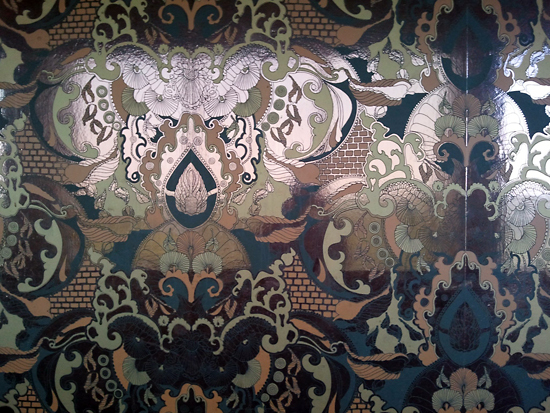 …because this wallpaper IS 1975 personified. And it has held up rather well, don’t you think? There is the fantasies that those of us who weren’t alive/participating in that era have, and then there’s reality. My fantasy for Top of the Tower might look a bit more like this series of photos. And maybe it did back in the day. Remodeling and updates happen organically over time, and restaurants – particularly – have to stay somewhat current and fresh to remain open. So we see a wide hodge podge of design fads piled atop one another. Obviously, the restaurant conveyed differently with furniture and lighting. Have you ever seen your favorite bar during the day, exposed to natural and overhead light? Then you know there’s a real magic to low lighting at night. Cocktails help everything along, of course. 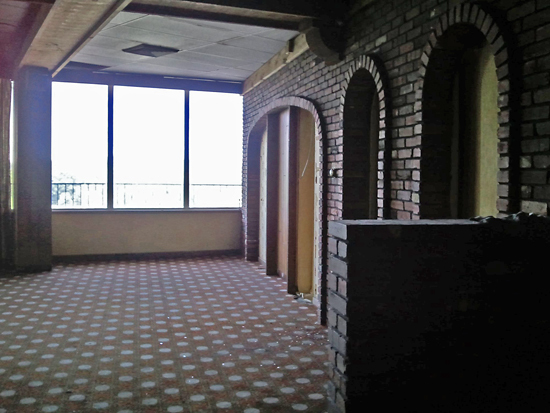 But in all the memories that have been shared about Rizzo’s Top of the Tower, it was never about the decor (though the views were a major treat). It was the people who worked there, the excellent customer service, the superior quality of the food, and the sense of specialness all of these things combined created for everyone who went there. We’re now looking at what remains of a place long separated from its magic. A major batch of thank you goes to Michael Collins for making these photos available to us. And for all of you who once worked there or ate there on a regular basis, could you please tell us about how the place looked over the years? What did it look like when it opened? What kind of changes were made over the years? Maybe seeing these photos will spark you memories and you’ll share in the comments as copiously as you did previously. If you have photos to share, that would be excellent, too. 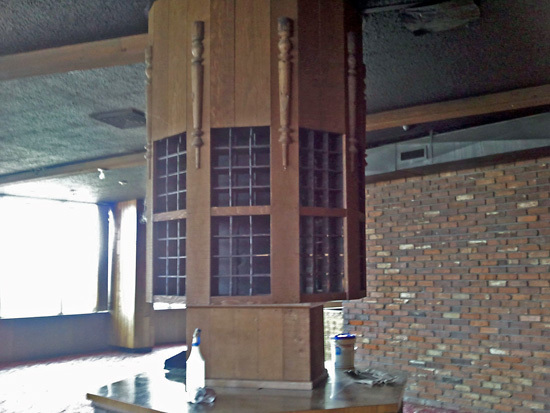 This entry was posted in mid-century modern commercial, north county modern, st. louis history and tagged michael collins, moline acres missouri, rizzo's top of the tower restaurant, spinning salad, top of the tower by Toby Weiss. Bookmark the permalink. Top of the Tower was my family’s go-to restaurant for special occasions. Being an only child, I got to go fairly often, and the postcard images were exactly how I remember it. The Spinning Salad was always something special, and I usually had their fantastic prime rib. I remember getting to go there for a couple of my birthdays, and we celebrated my grandparents’ 50th Anniversary there. 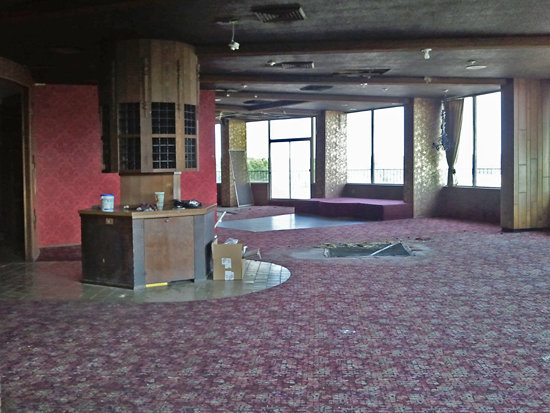 It’s a shame that so many North County establishments are gone, but North County changed very quickly. Technically, no, it’s not for sale. The County owns it, as a condemned building. That they want to tear down. Which is why they are not motivated to find a buyer. Or protect it. Which is sad as all holy hell. Thanks for showing the interior photos of the restaurant. 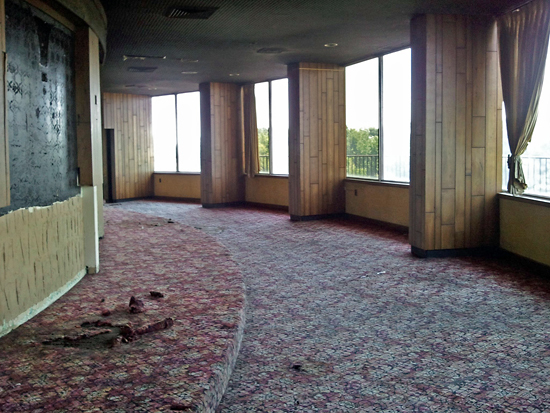 My parents dined at The Top Of The Tower Restaurant frequently but I was never with them. 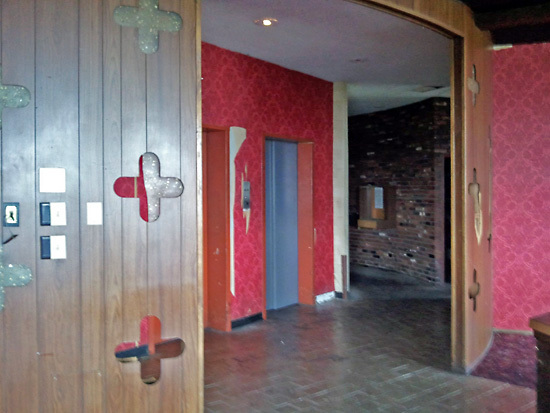 It is wonderful to see its decor after many decades! The offices of both our doctor and dentist were located on the second floor of the tower. We took our dog to “The Precious Poodle Salon” which was located in the attached shopping center. Our next door neighbor moved from her home on Angeline into apartment 901 of the Lewis And Clark Tower. She was a tour-guide at The General Daniel Bissell Home and would often be seen in period dresses. Needless to say, The Tower was the last word in fashionable living at that time! The appraisal district shows the square footage of apartment 901 to be over 1,000 so, no wonder it seemed large. We were fascinated with the view from the 9th floor balcony! The Lewis And Clark Tower was not only a place we visited frequently but will always remain a symbol of my childhood from 1961 until 1970 in the north county area. When I attended Central Junior High for one semester, The Tower was visible from many parts of the school. My eyes were always on it any time we drove by. I’m sure many, many past residents share the same memories. 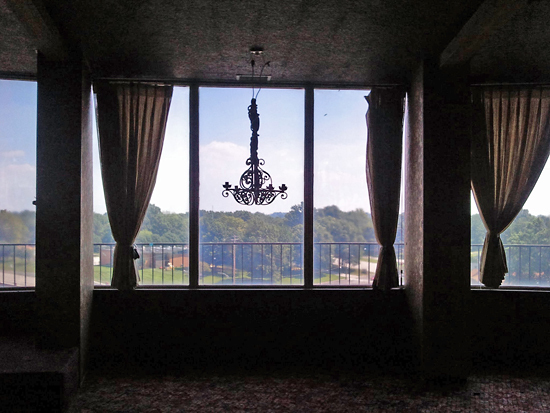 There’s a neat round hotel in Jefferson City that still has its restaurant on the top floor. Beautiful view of the Capitol. 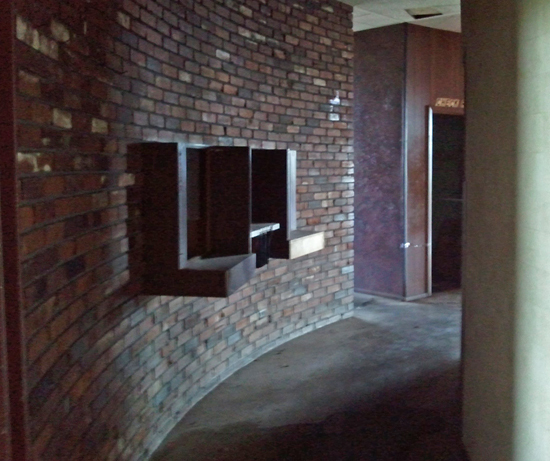 The hotel started out as a Holiday Inn in the late ’60s. Might have been a Howard Johnson’s later on. The current owners sunk millions into renovating it from top to bottom into a four-star hotel. I am a Cell tech and have to access the building several times a year since 2006. As far as the restaurant goes it hasn’t been touched since my first visit. Only change is more water damage do to poor roof conditions. I feel very lucky to get out of the building without any confrontation everytime I leave. When the elevators are working I’ve smelled weed on several occations on my way up and down. But the thing thats gets me the most is the 10-15 hot water heaters that are on the roof, not attached to anything and cannot believe these have never flew or rolled of the building. I now hear that this building is being condemned do to poor living conditions. This is what happens when Diversity forces out logic. The hood moves in with its social wrecking ball and destroys all things White. What’s left is ugly black racism and a destroyed landscape. The liberals extort yet another Marxist victory over the majority population that carved a nation out of the wilderness so the laziest of the nation’s populace can enjoy the fruits of everyone else’s labor. I don’t remember a lot of the restaurant, but I do remember Joe Rizzo. He and my father were fairly decent friends, and Joe always was very nice and warm and friendly to me. I remember my Dad living in one of the apartments, and thought it was SO cool that he lived in the place that he was part of developing. I don’t know all the stories about Bud Dallavis and John Defford and my Dad. I only knew that there was money problems, and that some people were cheated out of some money. I cannot confirm those stories, and I wish that they has had the money and time to develop the second tower. I thought that I was “all that” because my Dad was part of the Towers. oh well. Seldom is a building so far gone that it can’t be brought back to life. The apartments are still for rent and occupied, so it would just be the top floor, restaurant space that’s in raggedy condition? I work for the current leaser. It is run down that no one would buy it. It saddens me to say that. My grandparents and parents grew up on this place. I still go to the grocery store that is still the same one my grandpa went and shopped when I was younger. It truely said to see what happens to old places in St. Louis. Cathy S I remember you!! I have Tim W on Facebook as well as Joe W. Had Mark Tubbs but he’s not there now. 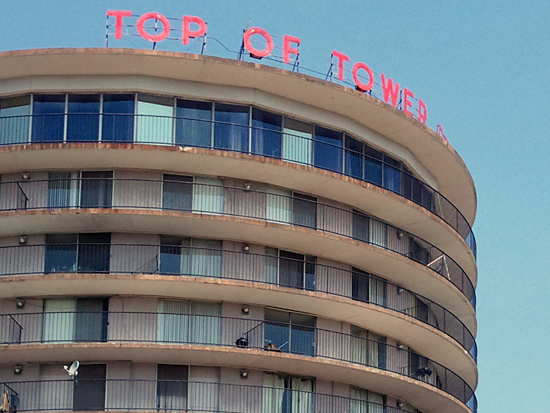 My father was a part time matradee at the “Top of the Tower” around ’68-’70 and for a short time I worked as a busboy. True, Joe Rizzo was rather stern guy but very fair boss. I remember Rene De La Torre another matradee. These pictures brings back so many memories as I also worked there in the mid to late 80’s, oh how I miss the place – great times with so many great co-workers & regular customers. Loved the spinning salad how could I forget the 21 secret ingredients spiel. Another person that comes to mind Marcel the Maitre d’ a classic french soul. A few co-workers that I can remember is Debbie the cashier, Sandy (waitress) & few others – would love to get back touch with fellow Top of Tower buddies. Wow, I worked there in the late 80’s, early 90’s… I have lots of great memories there, met lots of great friends! lol Joe Rizzo was my boss, he was a very good man, just grouchy sometimes! I remember Janet, she would NOT give me that secret recipe for the spinning saled dressing! She said it’s a secret! I would love to get in touch with some of the ole’ workers, like Tim( the cook),Mike ( another cook), Steve…lol Those are the ones that come to mind. Thanks for sharing the pics, enjoyes them so! Wow! Could never forget this place. I worked there for 16 years, as did my mom who recently passed away. It was my first job and I really loved it. So sad to see the pictures without all the beautiful tables, linen and candles, but remembering all my fellow workers who are no longer with us and those that still remain in the St. Louis area. It was a great place to work and even go to on your night off for a wonderful dinner. Best in north St. Louis county. Sure do miss the spinning salad! Thanks so much for the memories, but so sad seeing the pictures without the beautiful set tables. I worked there for about 10 or 15 years and it was like one big happy family. The Rizzo brothers were great bosses and treated everyone very good. We had really good customers and a few that came in every saturday night and always sat at the same table. The entertainment was also very good. Bob Kuban a St. Louis icon and Tony Viviano played on Friday and Saturday nights. I have missed the place very much ever since it closed. There are a few of us who worked there that get together and talk about the good times we had working there. Talking about that wonderful spinning salad, the book about N.County does not have the true receipe for that salad. I am also so sad about that it just cannot be duplicated. Oh shucks. Worked there for three years in the late 70’s. the worked sucked but made many friends. Going back a few years, how fun is that? We used to walk to school (Central Jr. High) and we took the elevator up one floor and it would let us out on the other side of the Tower on Lewis and Clark. Every once in a while, we would get balsy and go up to the resterant!! We were so scared we’d get arrested. Ah memeories. Great memories of a great resteraunt. My wife of thirty three years and I would go there occasionally when we were dating. I would love to haver the reciepe of the famous spinning salad. There’s a book out called cruizin north county and it shows pictures of the outside of the resteraunt. Originally the plan was to have two tower’s built on that location. Thanks for the memories. wow, I went to this restaurant for graduation june 1971. I feel so old now looking at these photos and the charles schmidt article too. And anyway, my first memories are of being swaddled in an aura of north county “spanish bachelor.” What a great name for that, I’ve always grasped at straws in trying to explain my nostalgia for plastic brick walls (that i used to push in with my finger) and dimpled beer mugs. This is fantastic. I have never been inside this building, but it always captured my imagination. I wonder if people still live in that building? Looks like the card is postmarked 1967 which would make it an original interior shot. Looks like it was always pretty dark in the place. I remember that place, but dimly. Mid century modern is one thing, but the choice of carpet and wallpaper is truly mind-bending. But that’s what was in style then. Any Las Vegas hotel of the same era would look the same. Pity they can’t pull the money together to renovate it and open the restaurant again. The views were magnificent. After reading this post I actually did a real estate search out of curiosity to see how much the apartments go for. Currently there are a few under foreclosure for about $5000 a piece. The foreclosures do sound tempting though… if I bought one however my husband would think I’d gone off my rocker!!! 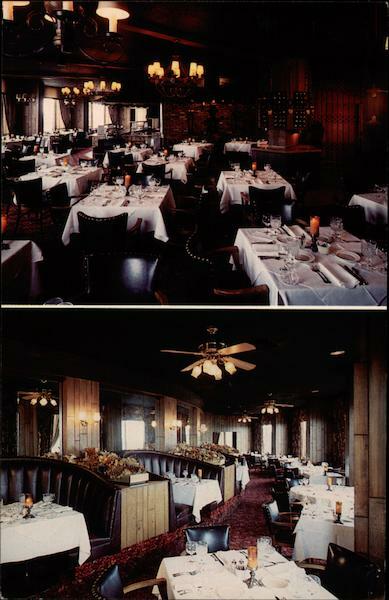 As for the restaurant, I found this image http://www.cardcow.com/images/set305/card00647_fr.jpg of Rizzo’s TotT in it’s heyday. With all of the white linen table cloths you can definitely see the appeal of the experience! Passed by this building on my way out to Alton, IL from South City. At first sight I was enamored with the old place. So glad to find this article and the one from a few years ago. While I was born in the late 80s, I remember many of the great buildings from my childhood before the city-wide demolition spree of the early 2000s. Thanks again. Toby, this post has changed my life. I have always had a love affair with this building. A couple of questions– are the apartments mostly occupied? Any chance you can get into one of them? I imagine some retrofabulous design in some of those units! TOBY!!! You take cool to a whole new level!!! They MUST post “No Trespassing” signs or you can’t be arrested for trespassing.